Can You Activate Sony Xperia XA2 (H3133) on Total Wireless? The short answer is YES (as of January 21, 2019). 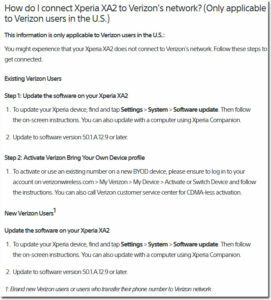 Originally introduced in early 2018 as a GSM only phone, Sony got Xperia XA2 to work on Verizon Wireless (CDMA) in August 2018. In my early days, Sony was THE KING when it came to electronics. So it was bit surprising when I decided on one of their smartphones how disjointed their marketing materials were. 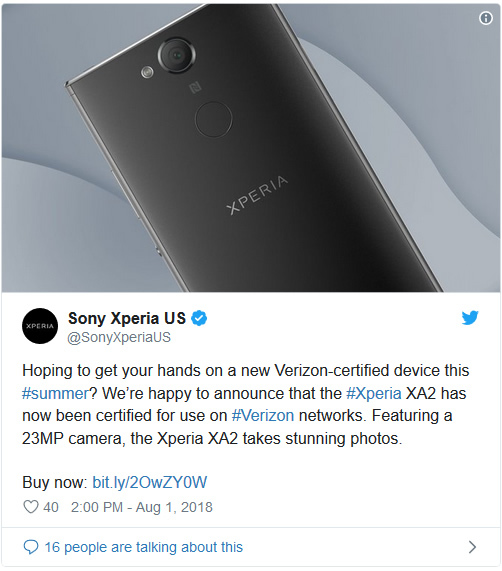 For example, in August 2018, Sony made a simple tweet announcing that XA2 was not certified to be used on VZW. The obvious problem is that the above communication does not address users who are on MVNO networks like Total Wireless (TW resells Verizon’s excess capacity). XDADevelopers – Anyone using this on Verizon yet? The most important fact about activating Sony Xperia XA2 on Verizon Wireless or VZW MVNOs like TotalWireless is to get a brand new CDMA SIM card that is in VZW SIM database. Once you have the SIM kit, get online and chat with TW’s agent to activate the phone and SIM. That’s it. No other setting to mess around. Hope this helps you out. Sony Xperia XA2 is a sweet phone for what I paid ($200 USD).